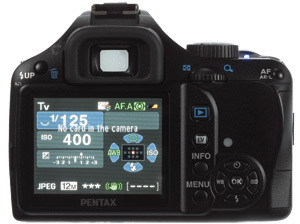 Unlike its predecessor, the K-m, the Pentax K-x features Live View technology. In my review of the K-m I commented that Pentax ‘may have missed a trick by not including a Live View mode’, so it is good to see it included on the K-x. The Live View image is displayed on a 2.7in, 230,000-dot screen, which is the same as that on the K-m. While not up to the standard of the current 3in screens found on higher-end models, it shows enough detail to check that focusing is accurate. Although Live View is now a standard feature, most photographs will still be framed using the optical viewfinder. This has a coverage of 96% of the final image, which is again on a par with other similar cameras in this price range. Viewfinder magnification is 0.85x, which is bright and large enough so you can focus manually with a degree of accuracy. Perhaps the biggest selling point of the K-x over the K-m is the video-capture facility. Video footage can be recorded in 1280×720 resolution (16:9 ratio) and also a lower resolution 640×416 (3:2 ratio). It is a nice addition to the camera, although not one that I feel will hugely benefit enthusiast photographers.